The release date of Jumanji 3 was announced by Dwayne Johnson on social media today. The action mega star revealed that the third movie will hit theaters on December 13th, 2019. Last year's Jumanji: Welcome to the Jungle was a massive success at the box office, nearly earning $1 billion worldwide. Additionally, it was a critical success as well, mostly for keeping the sequel in the same world as the 1995 classic while breaking new ground. The success of Welcome to the Jungle all but guaranteed that a sequel would be in the works. 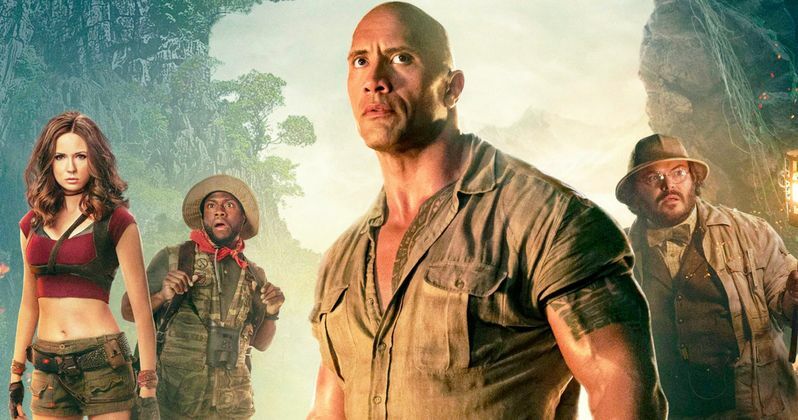 While he didn't offer up any other information, Dwayne Johnson did confirm that Jumanji 3 will feature "new characters" that were not in the last movie, as well as the return of Smolder Bravestone (Dwayne Johnson), Ruby Roundhouse (Karen Gillan), Sheldon Oberon (Jack Black), and Franklin Finbar (Kevin Hart). Johnson had teased that talks were underway a few weeks ago, but this is the first official confirmation that Jumanji 3 is moving ahead after it was announced that the sequel was targeting a Christmas 2019 release. Director Jake Kasdan is expected to return while it has already been confirmed that cowriters Jeff Pinkner and Scott Rosenberg are returning. Back in 2012, it was revealed that Sony was looking to remake 1995's Jumanji. Sony then announced in 2015 that the remake was going to be released in 2016, which led to a negative reaction because many believed that it was too soon after the death of Robin Williams. Jumanji: Welcome to the Jungle was temporarily put on hold until it was revealed in 2016 that Dwayne Johnson had signed on to star in the sequel. Jumanji: Welcome to the Jungle started production in September of 2016 in Honolulu, Hawaii, so it is assumed that Jumanji 3 will also film there. Since the 2019 release date is official, production will more than likely have to begin this fall, or at the very latest, this winter to keep on track for the December release date. Dwayne Johnson will keep his reputation as the busiest man in show business since the Jungle Cruise movie is reportedly going to start filming soon. Jumanji 3 will run into another interesting twist, much like the last movie had to do. Half of the movie was the players getting to know their avatars, so one has to wonder what the twist will be this time around. How and why will they need to revisit the game? Plus, the sequel will premiere a week before Star Wars 9, which will make for an interesting battle at the box office towards the end of 2019. Jumanji: Welcome to the Jungle was able to hold its own against The Last Jedi and played the long game during its initial theatrical run. Hopefully Jumanji 3 can pull off a similar feat. For now, you can check out the official announcement of the Jumanji 3 release date below, provided by Dwayne Johnson's Instagram account.